The True Cost: Out Today! You'll recall a couple of months ago we first mentioned The True Cost, a documentary on the rise and impact of fast fashion. The film premiered last night, and is now available for you, you lucky ethical fashion types, to buy, rent or stream. "Over the past two decades fashion has changed thanks to this new phenomenon called “fast fashion” and now we have a situation where, as consumers, we are caught in an absurd circle of micro trends. Think about it. Around two mini seasons a week in stores. Disposable clothes that stay in a woman’s closet for an average of just five weeks, before being thrown out – all in the name of the democratization of fashion. In reality, this evil machine is exploiting everyone and everything: the consumer, the planet’s resources and the people who produce them. Each year across the world, 1.5 billion garments are sewn by an estimated 40 million people, working in 250,000 factories. These are predominantly made in countries described by the UN as the world’s least developed. All in all, the garment and textile industry is estimated to be worth some $3 trillion. 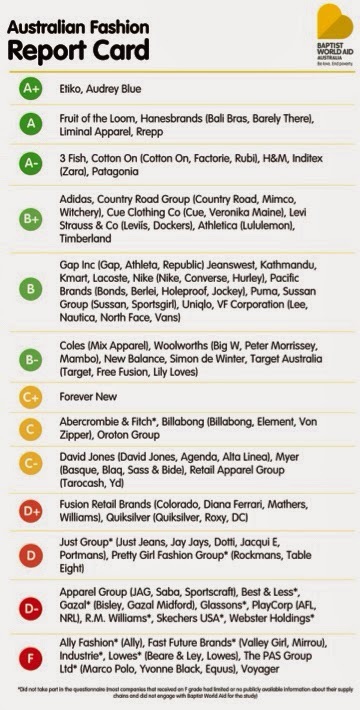 And the bulk of that goes into the pockets of the owners of those fast fashion brands." Livia Firth and her agency EcoAge have been pushing hard to get the evils of the fast fashion industry out to the general public; the Primark shoppers, the people that know a bargain. The trick is to get them to think differently about clothes, to view them as more than a disposable purchase. Lucy Seigel, who also appears in the film, says it best: if you're eyeing up an item of clothing, consider whether you'd wear it thirty times. If not, question why you want it and, more importantly, if you need it. We'll be reviewing The True Cost next week, which means I get to put my film reviewer's hat on for once, hooray. In the meantime, there are screenings of the film worldwide tonight, from New York to Spain. In the UK, it's showing at the Curzon Bloomsbury and Birmingham City University's Parkside Lecture Theatre. If you fancy organising a screening of your own, get in touch and help spread the word: put in a screening request here. Otherwise, digital copies of the film are now available, with Blu-Ray and DVD copies shipping soon. If you have any interest in ethical fashion, you should get behind this movie. It's very easy to point fingers in the ethical fashion game. Sat in my ivory tower (oh, alright, my shack at the bottom of the Pier) it's no problem for me to bash out angry screeds on how manufacturers and owners should do more for their workers, even if it means dropping a tiny bit of profit or raising their prices a fraction. But what if the stylish loafer was on the other foot? If I had to make the decisions that keep a factory running, if I had to make the difficult choices about pay and conditions, what would I do? A play at the Young Vic, World Factory by Zoe Svendsen and Simon Daw, sets out to show us life at the sharp end of fashion. Part interactive theatre, part game, World Factory divides the audience into teams and then issues them the task of running a clothing factory in China. The scenario and data management are computer-controlled. The challenges are manifold: troublesome workers, non-paying clients, what to do when the complience officers come snooping around and your fire extinguishers aren't up to code. The end result is surprising: given the chance to act ethically, most of the audience choose to veer towards profit, regardless of the negative impact on their workers. "Most people who were given the choice to raise wages – having cut them – did not. There is a route in the decision-tree that will only get played if people pursue a particularly ethical response, but very few people end up there. What we’ve realised is that it is not just the profit motive but also prudence, the need to survive at all costs, that pushes people in the game to go down more capitalist routes." All the metrics generated by the audience are shown and displayed, revealing that people will choose to make hard choices to stay in the game. Therein lies the problem. A closed factory is no good to anyone. Yet the forces at work on it, from NGO's spying with hidden cameras, to a workforce with little sense of loyalty that will walk away at a moment's provocation, make every day a juggling act to simply stay afloat. The hard fact is that while many big brands have real and binding commitments to ethical behaviour, there are so many other forces at play that it's next to impossible for managers to run their factories to the proper guidelines. Corruption and the unwillingness of government to appropriately punish it have big roles to play in this rigged game, and that's something that factory owners can do little to solve. As the stunned audiences at The Young Vic are discovering, it's very easy to talk up an ethical stance, but putting it into practice in the places that matter is a hell of a lot more difficult. There's something strange going on in Villiers Street, in the heart of London. And it might just change the way we think about a big urban problem. Litter is one thing we humans are really good at creating. It just seems to appear, wherever we are (or, in some cases, in places where we've never been seen: take the phenomenon of ocean plastic). The thing is, half the time we don't even realise we're leaving it. It just seems to be there, and there's not much we can do about it. Well, that's rubbish. And patently untrue. All it takes is a little education and positive reinforcement to keep Britain tidy. Which is why our pals at Hubbub are doing a little thought experiment in Villiers Street, near Charing Cross, to help people keep it a little cleaner and neater. Hence the hashtag: #neatstreets. 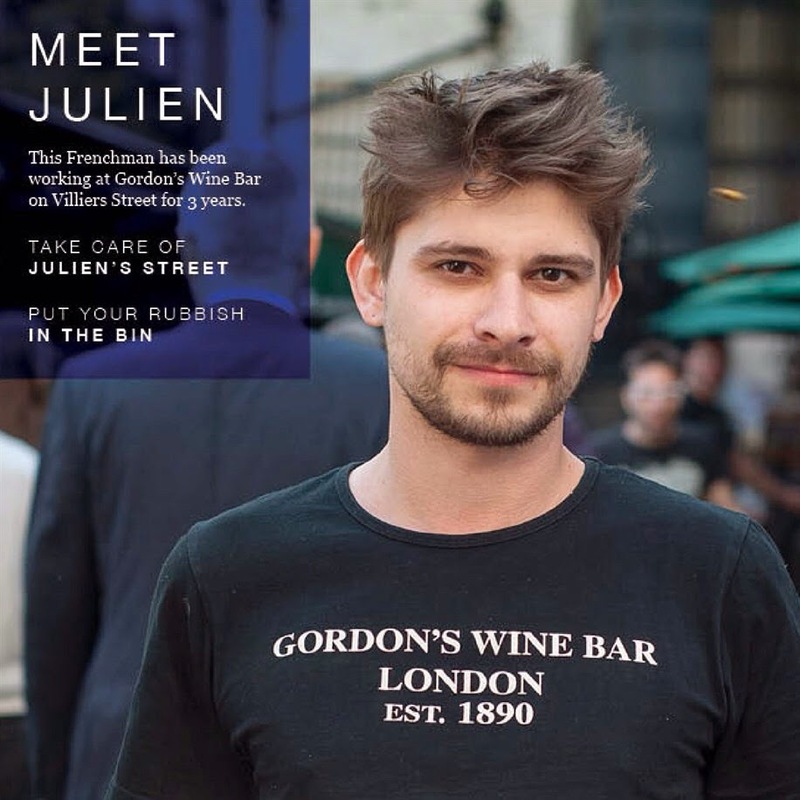 Would you want to drop litter on Julien's street? Course you wouldn't! There's some clever stuff going on here. Empathy is part of the mix: if you care about somewhere, you're less likely to mess it up. So Hubbub are putting up posters featuring the guys and girls that work in the area, tying a place to a face. There's humour involved too: one of the bins on Villiers Street will belch and munch when it's fed on your rubbish. How about the sticky issue of chewing gum, which seems to be a permanent fixture on our streets, under tables in pubs and restarants, on the soles of our shoes...? Well, here Hubbub have teamed up with Gumdrop, an initiative seeking to recycle old gum into new products like coffee cups and wellies. After all, chewing gum is effectively just flavoured rubber. 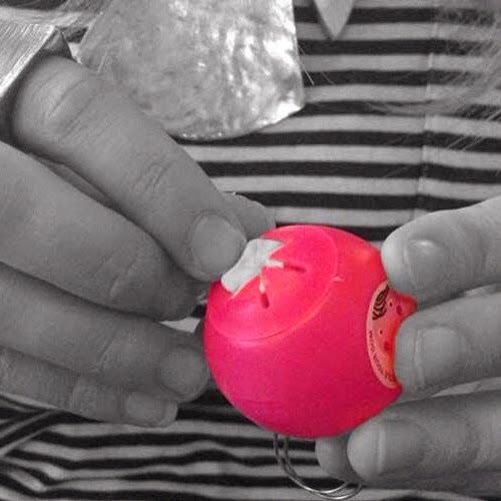 Using Gumdrops-On-The-Go, a neat solution to what you do with the stuff once it's lost its minty freshness, the hope is to cut right back on the grey spackling that dots every paving slab in the city and do something useful with it. Don't drop it... Gumdrop it! It's a fascinating experiment, and here at the Pier we'll be intrigued to see what comes of it. Could this be the first street that leads the way to a cleaner capital? A fire in a footwear manufacturing factory in Manila claimed the lives of over seventy workers earlier this month. The fire is believed to have been started by welding work at the factory entrance, which sparked an explosive reaction in the chemicals used to make the flip-flops in which the building specialised. Most of the victims are believed to have succumbed to the thick smoke from burning rubber and chemicals, which produced flames so intense that the jewelry the victims wore had melted or fallen off. They were recovered mostly from the second floor, where wire gratings over the windows may have impeded escape. Identification of those who died is being hampered by the severity of their burns. "Definitely there will be charges here, because people died. Regardless of whether it was an accident or arson, people died. We are just determining what exactly happened so that we can clearly define what charges to file." Meanwhile, a knock-on effect to the earthquakes in Nepal is causing concern in the fashion factories of Bangladesh. At least two buildings have been deemed to have suffered substantial damage to their foundations as a result of the aftershocks, which were felt throughout the sub-continent. It remains unclear as to whether these companies are still trading, or how many others like it continue to allow workers through their doors while their buildings are in a dangerously compromised condition. Yet again, we find ourselves in a position where people's lives are being endangered or lost in unsafe factories. Meanwhile, the huge multi-national companies who provide the financial reason for those factories being there do little or nothing to help. It's becoming clear that it took US trade sanctions against Bangladesh to kickstart the BFSA. If not for that, little would have changed. Let's be clear. When we talk about the fashion business, the emphasis is strongly on the second word. The awful truth is that when there's money to be made, life can be very cheap indeed. This June, our chums at WWF think it's about time you went a little wild. Now, I'm not talking about dancing on your desk at work or blowing your savings on a VW camper. I mean, you can do if you want, but that's not what I mean. On June 5th, the WWF are asking you to Wear It Wild, to help raise money and awareness for their brilliant and important conservation work. What do they mean by wild? Well, that's up to you. You can keep it as simple as wearing a pair of leopard-print socks. Maybe a pair of those cat-ears on a headband. Or you could go completely ape and wear a gorilla costume. The choice is yours. When you sign up for the event at http://www.wwf.org.uk/wild, you'll find action packs and a ton of great fundraising ideas: a sponsored walk, perhaps, or an animal-themed rugby match. I wonder if anyone's told the Springboks? However you do it, it's easy to go wild in a sustainable way. Have a nose round your cupboards, hit the charity shops. Get out the glue and card, and get creative. And, needless to say, it's fake fur only, please! All the fun helps WWF with their work, which is more important than ever. In the last forty years we’ve seen wildlife populations decline by more than half. The number of tigers in the wild, to take an especially worrying example, has reduced by 95 percent in the last hundred years. Thousands of other species are also threatened. WWF need your support to show you care. So, what are you waiting for? With less than a month to go, the time is right for you, your friends, family and workmates to Wear It Wild! Get involved. It's gonna be grrrrrreat. Archeologists, when exploring a long-gone civilisation, have to work with the artifacts that are left behind. The stuff that, for whatever reason, has lasted. Metal. Glass. Ceramics. Those artifacts tend to allow scientists to group cultures into different ages, based on the most prevalent materials around. The Iron Age. The Bronze Age. It's commonly thought that when future archeologists look back at us, they will describe the 20th and 21st century as The Plastic Age. In the fifty years since petroleum was first refined into a hard-wearing, long-lasting material, plastics have taken over the world. And that's a problem. In the most remote areas, in places where humanity has never settled, you can still find plastic. We've all heard of the island of trash floating 1500 miles from land in the middle of the Pacific Ocean. There's more of it out there with every passing year, in places we always believed to be pristine. The trouble with long-lasting materials is that they last for a very long time. It just doesn't degrade in the way that natural materials do. This is cause for worry, naturally. But it might not be cause to throw in the towel quite yet. See, as the cost and difficulty in recycling plastics drops, that island of junk in the Pacific stops being an obstacle and starts to look like an opportunity. An untapped resource, ripe for the taking. Which brings us, finally, to the remit for this blog. Pharrell Williams has teamed up with G-Star Raw to launch a range of jeans made from recycled ocean plastics. To promote the new line, there's a documentary on the whole issue, that's well worth a look. Now, no-one's claiming that a range of jeans is going to solve the global problem of waste plastic. But the involvement of a big name like Pharrell will make people pay a little more attention to the issue than they would otherwise. And that has to be a good thing. Take a look at the whole thing, and start thinking about plastic a little differently. Last month, H&M launched its latest Sustainability Index. A positive document, it cheerfully outlined the upwards step change in the brand's use of organic cotton, the way it was lessening environmental impact and its social welfare programmes. It all seems pretty good, and a clear sign of how H&M takes its self-imposed role as the greenest chain on the high street seriously. But, as Marc Bain of Quartz explains, there's a little more to it than that. The trouble with a global brand like H&M is that it simply can't be sustainable. The problem? The fast fashion model itself. H&M is a volume business. It makes money by manufacturing vast amounts of clothes and selling them cheaply. For H&M to profit, those clothes have to fly off the shelves. Head of the company Karl-Johan Persson has boasted of the fact that you will see different ranges in his stores from week to week, and he expects to see the racks refreshed daily. In fact, the clothing giant manufactures over 600 million items a year, across a store footprint that's growing by 10% a year. More clothes means more demand for cotton, which even in its organic form is a thirsty plant that needs lots of water to grow at the volume required. Clothing manufacture requires a lot of water, and in the regions where H&M make their clothes like China and Bangladesh, water access is becoming a big problem. More clothes means more demand for power and oil. Transportation, one of the greatest contributors to greenhouse gases, is a major stumbling block to any company pushing sustainability. Those clothes don't get into the stores worldwide by solar-powered rickshaw. And then there's issue of what happens to those clothes at the end of their life. H&M are doing their best, working hard on research into cradle-to-cradle models. But currently 0.2% of H&M's clothing contains any sort of recycled material. It's great that they're using more organic cotton. But most of it is still destined for landfill. It's good to see sustainability reports coming from such a major player--even five years ago this would have seemed unthinkable. It's clear that H&M are working towards being the best that they can be in terms of emissions, in moving away from pesticides, and in worker relations. The trouble is that these are tiny changes in a vast model that is, by dint of its very existence, bad for the planet. I hope it hasn't escaped your attention that there's an election looming in the UK. I'm a sucker for a ballot, and make sure I get to the voting station on time (or frequently a bit early: at the last European elections I was the first man to vote in my ward). It's a big deal for me: the one chance we get every five years to shape our government. But what does the election mean for ethical fashion and charities? If we wanted to vote based on the remit offered by this here blog, what would we need to know to ensure we put our cross alongside the party that best supported our views? No party has a policy relating directly to our needs. Most have vague promises to tackle domestic slavery (which could mean any form of sweated labour, although most people read it to mean forced prostitution). It should be noted that there's a cross-party group on Ethics and Sustainability in Fashion, looking into issues like the environmental impact of fast fashion, child labour and the like. It should also be noted that this group hasn't convened since June last year. So, if we don't have anything specific, we can at least zero in on issues that touch on our concerns and, with a eye to the past five years, see what promises have been made and kept. The coalition of Conservative and Liberal Democrat came to power in 2010 with manifestoes that, underneath the urgent financial measures, contained pledges on climate change and the closer integration of the Third Sector into public welfare: the so-called "Big Society". It quickly became clear, as budget cuts began to bite, what that meant. Welfare was kicked over at the knee, and charities were expected to step in and clear up the mess. The end result: a million people in foodbanks, poverty biting harder than ever, and a gloomy charities sector struggling to cope. After 2012, we heard very little about the Big Society. Environmental promises also went unkept. David Cameron's claim to head the "greenest government" foundered under the steely gaze of austerity politics, and plans to increase spending on wind farms and home solar initiatives were badly formulated and quietly dropped. As we head into the election, Tory enthusiasm over fracking and the crude oil find at Gatwick shows a government still beholden to the fossil fuel lobby, despite the best efforts of the green-leaning Lib Dems to put environmental issues on the negotiating table. Cameron's call to his policy heads to "get rid of that green crap" say it all. So where do we look for a party that supports the environment and ethical issues? The obvious answer has to be the Greens, who have major environmental pledges baked into their manifesto. Green MP Caroline Lucas has attended seminars on ethical fashion, and has made it clear that she supports charities like Oxfam. Sounds perfect, right? The problem is, of course, that the Greens, despite the so-called "Green surge" are unlikely to build that momentum into a majority. As it stands, they'll be lucky to hang onto the one seat they do hold. Environmental and ethical issues are, for the most part second-class citizens in a political debate dominated by the economy and the NHS, although the increased focus on immigration has has the unwanted effect of demonising the low-paid migrant workers who make up so much of the retail, service and medical sectors -- the exact opposite response for those of us who like to believe that dignity in work should be a cherished human right. Should we be downhearted? Is there no-one looking out for ethical fashion and charities in the government? Well, here's the thing. It's likely that we won't see a majority government this time around, which makes more space for independent voices in government. The ConDemNation may have failed, with an innate failure of two factions to agree on core values. But that doesn't mean we should consider partnership at the highest level to be a bad idea. With the notion of proportional representation re-emerging more strongly than ever, we could be on the brink of a more representative Parliament, one that allows the message of fairly paid work and support for charities to be heard and acted upon. One last thing. I'd just like to add my voice to the many who are urging you, however apathetic or angry about politics you are, to vote. It's estimated that 15 million people didn't bother in 2010. That's a majority that far overwhelms every other party's vote count. Don't make the assumption that politics has nothing to do with you. The coalition that has spent the last five years failing to deal with the deficit and stripping the NHS down to the bone came to power because not enough people cared to vote for a particular party. That shouldn't happen again. Tomorrow gives us a chance that doesn't come around often enough... to start again. We should not let that chance slip away. No-one wants to think that their clothes are products of slavery. Regardless of how cheap the item is, if you offered it to customers with a big sticker saying that it was made under sweatshop conditions, it's likely that you'd get very little takeup... and possibly reported to the authorities. There's a wilful blindness at the heart of fast fashion, an "out-of-sight, out-of-mind" attitude that means consumers have to be clouted repeatedly over the head with the idea that there is a good reason that cheap clothes are so cheap. It's most likely going to be labour costs in the form of fair wages that have been crossed out of the costing analysis. 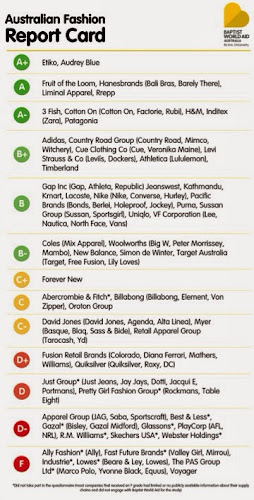 What we really need is a list of how different fashion brands stack up on this important issue. Maybe even something like a league table. The ability to see at a glance how they compare on this most basic of ethical issues could really enable we the consumers to put pressure on the underperformers. Matt is careful to note that having good ethical practices in place is no guarantee that these practices are being adhered to. But at least we're in a position to make a judgement based on more than price or look.